CORNEMPS is a remarkable site. 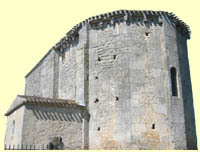 OUR LADY OF CORNEMPS was built in ruins, from which a part was rebuilt. 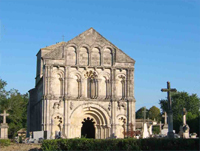 The previous Church was 35 metres long, announcing by its great size an important population surroundings, as well as the presence of a convent (Abbey of the Benedictine's fathers). It was destroyed during the Religious wars around 1587. Indeed, CORNEMPS was for a long time a parish, different from that of PETIT-PALAIS. These 2 parishes depended on the important Châtellenie de PUYNORMAND, that covered a area until the Juridiction of ST-EMILION . The name CORNEMPS has a Celtic-Gallic origin, "Cor-Nemetum", that means " SACRED PLACE ". In addition, in vineyards growing on the surroundings hillsides , it is not rare to find cut flints, of various prehistoric times, proof of the former human activity of the area. Filled with the extraordinary memory of these places, Henri-Louis FAGARD, Florence and their team, elaborate day after day their Wines, enriched by a supplement of soul.